Here at Repel Restoration, Inc. customer satisfaction is the number one priority that we strive to achieve with all our clients, no matter the size of your project. During our estimate briefings, we explain every detail of the customers proposed project. These details include, but are not limited to: project explanation, debris removal, maintenance, project scheduling and of course, the estimated cost of the project's production. Our networking skills are top notch, so most of our work is generated by our clients referrals. Several of our compliments have come from both our customers, as well as our competitors. Our hard work, patience, and attention to detail is what helps us stand out from the usual crowd - while providing a comfortable relationship between ourselves and our customers. We hope you find our company website knowledgeable and consider using us on your next project or repair. We appreciate the opportunity to serve you and look forward to making you another one of our satisfied references! If you have any questions or inquiries, please visit our contact page and reach out to us today! 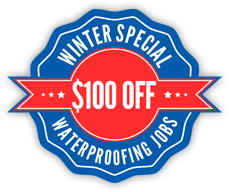 About Our Basement Waterproofing Services: Basement concrete cracks are a very common. These Cracks can occur for many different reasons. Cement shrinkage or expansion, often caused by the temperature changes due to the Long Island seasonal weather conditions, are the most common causes. These cracks are often harmless and most just affect appearance. However, it is possible that some of these cracks are more serious, especially when they lead to leakage. If you are unsure of the seriousness of your basement cement cracks then you should have your basement inspected. Call Repel Restoration for and ask for our basement crack inspection service. 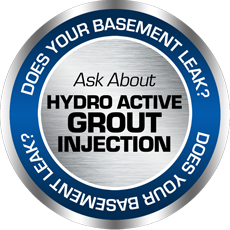 Please explore our website or click here to learn about our general basement waterproofing services or to learn more about how we utilize Hydro-Active Grout Injection to solve many of our Long Island Basement Waterproofing problems. At Repel Restoration , we believe that our service, the quality of our work, and our fair and affordable pricing gives us an edge over all our competitors. Although the uninsured, unlicensed contractor may (sometimes) charge a lower price, we strongly believe that if they aren’t committed enough in their own business to invest in it properly then they are not the correct choice for our clients who are choosing to invest wisely in their home or business. Wet take our business seriously enough to be licensed & insured and we intend to be around very long — servicing and maintaining all our Long Island clients. Rest assured that Repel Restoration, Inc. is the RIGHT CHOICE!